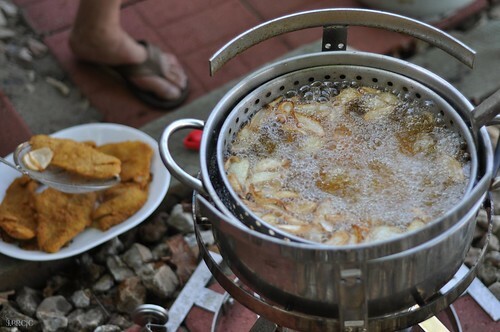 So I told you on Tuesday that I learned that Anthony holds a weekly fish fry with his neighbors. Their housing complex has a very nice shared kitchen on the ground floor where the guys get together on Saturday afternoon to fry some fish. “My neighbor Dennis catches the fish and brings it home, cleans it and individually bags and freezes them.” But once a week Anthony, Dennis and another neighbor, Mr. Hoyer, come together to cook. “He catches crappies…or whatever he can get really,” Anthony tells me. “The bottom of fridge is literally full of fish come Saturday.” While Anthony doesn’t participate in the fishing, his friends are quite the avid fisherman. “Sometimes they even enter tournaments,” he explains. “And you bring the potatoes,” I asked him. Check out Anthony&Me next week for another of Anthony’s kitchen favorites: Fish Omelets.